Musical activities at the Conference extend beyond the scheduled coaching sessions, embracing multiple opportunities to play, listen, and learn about music. The activities described on this page occur in all weeks of the Conference, unless otherwise noted. During free, unscheduled time, participants and auditors can form their own ensembles with new and old musical friends. Through the Guest Faculty program, participants and auditors have unique opportunities to make music with professionals. How much or how little you participate in informal playing is completely up to you. 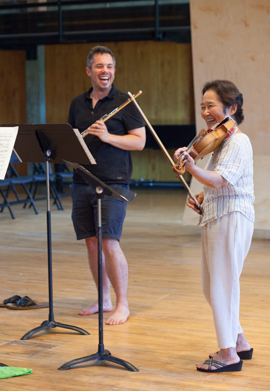 The Conference's extensive library of parts for over 1,000 works is available to the Conference community for informal playing, as is the Bennington College music library. The Conference faculty presents chamber music concerts on Wednesday and Saturday of each week. Concerts are free and open to the public. See the Concert Series page. The Conference community is invited to attend open rehearsals, as faculty groups prepare for performances on the Conference Concert Series. 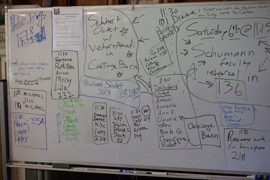 In Weeks 2, 3, and 4, guest lecturers and/or members of the faculty present seminars, often related to the music programmed on the Conference Concert Series. Seminars are free and open to the public. See the Seminar Series page. Informal musicales on Wednesday and Saturday afternoons provide participants the opportunity to perform works on which they have been coached during the week. In Weeks 2, 3, and 4, the Composer-in-Residence holds an informal lunch-hour talk, sometimes including recorded musical examples, in the Commons building. 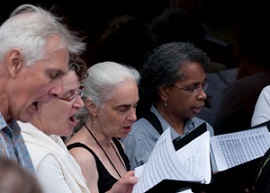 Participants often gather before the faculty concerts for informal, outdoor madrigal singing.